Measurements: The beads measure 4mm. Characteristics: The beads have an all over faceted surface. The links are silver tone. There are approx. 34 beads per foot. Additional Information: This was found in old packaging that only stated it was rosary chain, no country of origin was found. If you purchase more than one lot at a time you will receive a continuous piece unless otherwise instructed. When I reported a problem, it was quickly sent. Great chain and excellent customer service! Very dainty and as the photo depicts. Thank you for shipping and having a decent product! My customers love these rosary chain! I'll probably be ordering more! 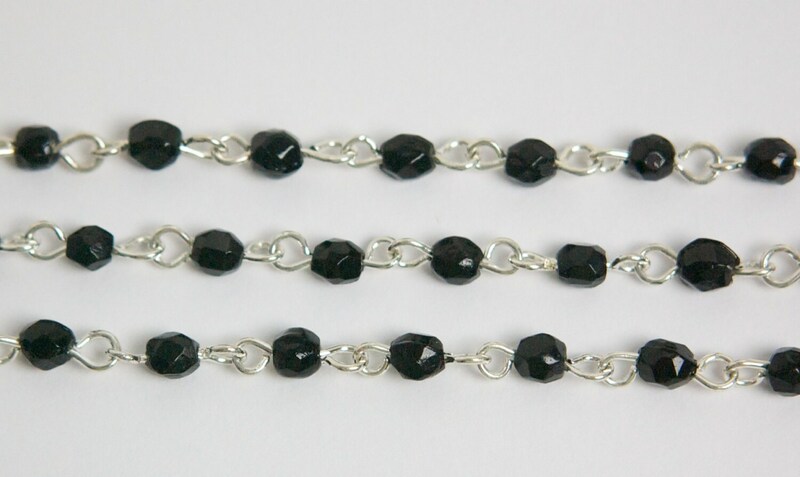 Classic elegance sums up the craftsmanship and stylishness of this jet black bead link chain.